(Updated on August 13, 2018) There is a great discussion among professionals about the opportunity to substitute the bulky DSLR (Digital Single Lens Reflex) cameras by the new appeared mirror-less, even more the last EVIL (Electronic Viewfinder Interchangeable Lens) full frame camera systems. The debate was not so evident while the offer of EVIL cameras was restricted to Four Thirds (≈ 13x17mm) or APS-C (≈ 15x23mm) sensors. It is well known that incorporating the same number of photo-detectors in a reduced size sensor encompasses a reduced too photo-detector size. For a given light conditions, this implies a weaker signal that must be amplified with the consequent noise amplification. A smaller photo-detector is also quickly limited by diffraction, resulting in a poor quality or useless at the smaller diaphragm apertures. But all these problems can be overcome if the EVIL camera body equips a Full Frame sensor (≈ 24x36mm). 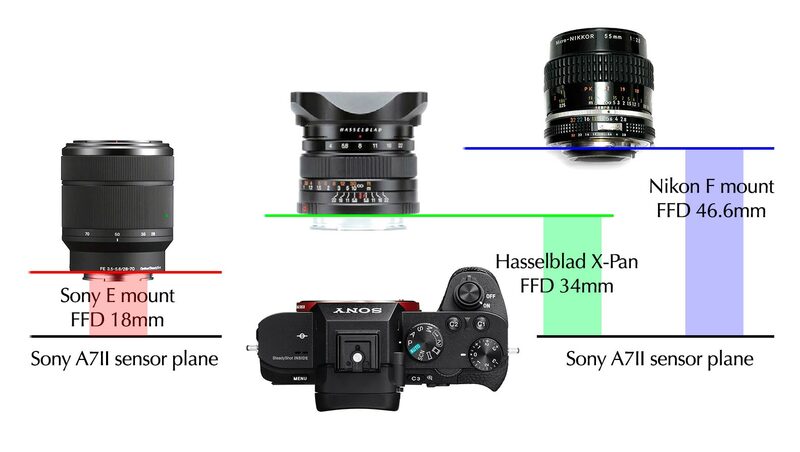 The comparison with DSLR full frame camera bodies is now unavoidable. In the past summer post on this site, Photographic Gear Evolution, were explained some advantages of substituting a DSLR (Nikon D610) with three or four lenses of fixed focal length by a new full frame EVIL (Sony A7II) with a starter kit zoom lens. Although the image quality suffers some loss in the first approximation assays, it was nothing serious, at least taking into account the kind of use the author is involved in. Nowadays, with one year of practical work with this equip, there are some more considerations that can be added not only to the own usefulness, but to the above cited discussion on the DSLR and EVIL comparison. The difference in quality shown between the use of the zoom lens at about 45mm of focal length or the former Hasselblad XPan 45mm lens, was found quite important with a subject at medium to long distance. A loss in quality is more evident when the distance reduces the size of the objects in the scene. At close taking distances, this quality difference can easily be compensated by digital image processing, but textural information lost in medium or long distances is unrecoverable. A great part of my images are taken in squared framing. In my case, the squared option is used for aesthetic reasons. I find a lot of subjects that I feel better balanced in a squared composition. The second option I use more often is the so called portrait format, being the landscape orientation the less used. This great number of squared pictures do me less sensible to the differences in quality usually attributed to the corners of the image by comparison with its center image quality performance. Because the Hasselblad XPan 45mm f/4 lens allows for a minimal subject distance of only 70cm, it was also necessary the recovery of the old Micro-Nikkor 55mm f/3.5 lens for short distance or close-up work. The Electronic View Finder is almost independent of the ambiance light level. Even in the shade of forest, at close subject distance and with a lens not specially luminous, the level of brightness in the viewfinder or the rear display is superb. The Peaking Function, with options of both color and brightness level, shows the subject shape actually in focus. The better performance is obtained with the lens wide opened. The ability to select the focusing area in several modes and sizes and most important, in any place all over the complete full frame. The quality of the zoomed image both in the viewfinder and on the rear display. Often, this enlarged image with the lens at the widest opening, is the best suited option to accurately focus on a concrete location. The orientable rear display complements the previous advantages. It is specially suited to avoid the inconvenience derived of the use of the viewfinder wearing varifocal graduated eyeglasses. Obviously, all those advantages are described from a work with the camera always mounted in a tripod and looking at static subjects. The work in street, sports or wildlife will put into play the more or less quality provided by the different AF lenses available for this camera bodies but this is another completely different matter. Coming back to the kind of peaceful photography I practice, the Sony A7II with the pair of lenses above described is a compact gear far better usable than my former Nikon option. But…, there is always a but. Along this year of work, I have also realized that in the images taken in portrait framing, there was some lack in quality at corners, specially with those taken with the Hasselblad XPan 45mm f/4 lens. This is not so clearly perceived in the images taken by the Micro-Nikkor 55mm f/3.5 lens. A general approximation to the photographic optics states that most of the residual aberrations present in a given camera lens can be avoided closing down the aperture, while some others, the so called field aberrations, cannot be corrected by this method. Nevertheless, paying attention to the characteristics of the Hasselblad lens I’m using, there are some questions not so easy to answer. The Hasselblad XPan 45mm f/4 lens is intended for a panoramic format of 24x65mm. Then, its image circle covers a diameter of ≈ 69mm, far beyond the 43mm diagonal of the 24x36mm sensor from the Sony A7II. The lens MTF chart provided by Hasselblad (Fig., 1) shows as, at the limit of the 24x36mm frame (white background in the chart), no value falls down at all in a significant way. Figure 1. MTF chart from the Haselblad X-Pan 45mm f/4 lens. In the days of film, the Hasselblad XPan 45mm f/4 lens yielded a superb quality from center to the corners of the image field and it was not obvious difference working at relatively closed apertures. Nowadays and working with this lens at the diaphragm of f/16, as is usual in my field work, any change in quality on the corners of the pictures taken with the Sony A7II cannot be initially attributed to the lens performance. In order to measure an image quality indicator, the system MTF by the Slanted Edge Method (Image Quality of Photographic Cameras) was measured for each camera-lens combination, both on the picture center and at the extreme of the field. From this measurements it was extracted an standard of quality, the MTF50. The MTF50 indicates which is the frequency where the system retains at least the 50% of the existing contrast. All measurements were taken at the f/8 aperture value. This figure ensures a good residual corner aberrations correction and do not supposes a conflict with light diffraction and photo-detector size. 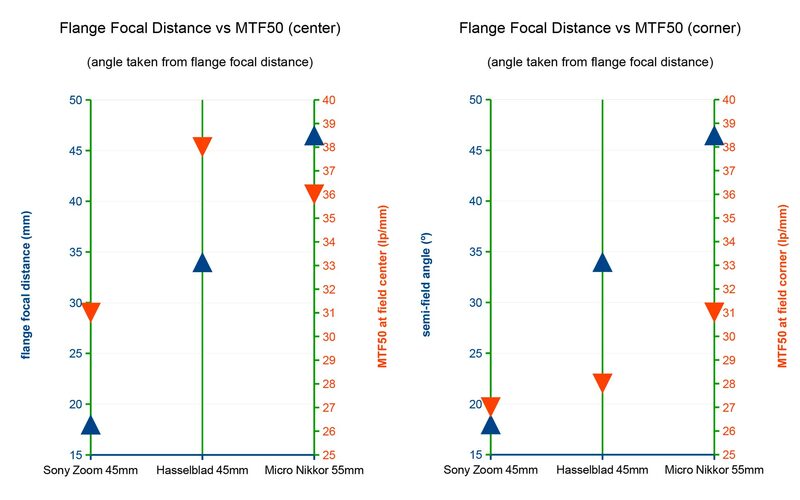 A comparison between the measured MTF50 values with the respective Flange Focal Distance drives to the results shown in the Fig., 3. Figure 3. Image quality MTF50 standard vs Flange Focal Distance at the image field center (left) and corner (right) (click on the image to view an enlarged version). At left, the plot shows the MTF50 values (red) vs the respective FFD (blue) for the three tested lenses at the center of the field. There is not any correlation between them and each lens-sensor combination shows its own quality performance. At the center of the field the light rays angulation is zero and as it was already shown by the system MTF (Photographic Gear Evolution), the best performance is shown by the Hasselblad XPan 45mm f/4 lens, followed by the combination with the Micro-Nikkor 55mm f/3,5 lens. Finally, the poorest result is the obtained by the Sony Zoom at 45mm focal length. Nothing controversial with expectancy. Nevertheless, looking at the plot of the right in the same Fig., 3, it can be clearly appreciated a clear correspondence between FFD and image quality performance. The lens with the shorter FFD shows the poorest result. In this case is the Sony Zoom. Following it, the Hasselblad XPan 45mm f/4 lens combination suffers a severe fall down in quality respective the obtained at the field center. The quality value obtained is not so different to the measured from the Sony Zoom. Finally, the best result is for the Micro-Nikkor 55mm f/3,5 lens combination, having also the longest FFD and hence, the narrowest angle of light rays at the field corner. Although absolute figures cannot be directly related or compared, the tendency is clear, at least in this case and with these camera body and lenses combinations. 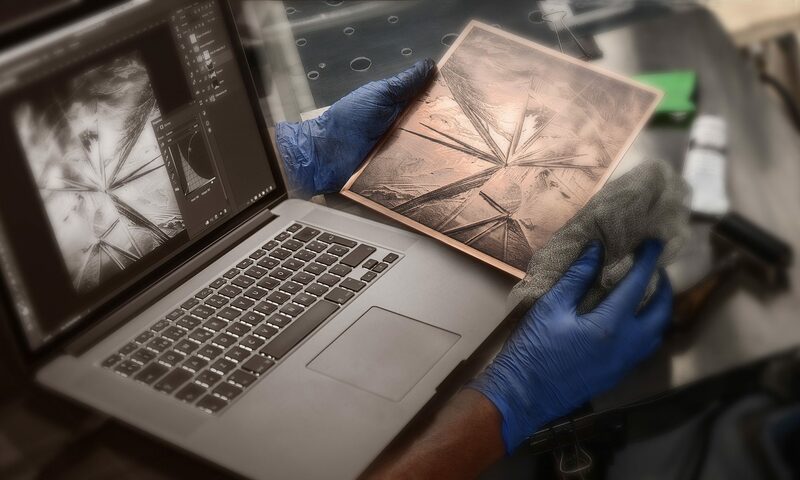 Indeed, the results of the trials are closely related with the field observation in pictures covering the complete 24x36mm frame. Also interesting is to observe that with the Sony Zoom lens, the difference in quality is not so easy to detect probably because the image quality is of low level even at the picture center. Human sight is surely more capable to detect comparable performances than absolute but isolated differences. Another question quite different would be, for a given purpose, determine if the differences in measured quality are significant in terms of perceived quality. Once again, the evolution of photographic gear is submitted to a back and force path. When the SLR camera bodies were popularized in the second half of the Twenty Century, one of the criticisms that they had to endure was their need for retro-focus design at the shortest focal length lenses. This was forced by the minimal FFD necessary to allow the reflex mirror box. On the contrary, classic rangefinder camera bodies were able to mount its lenses as close as necessary to the film plane and this does not compromises the optical design. But in those days the light must reach the film and film was a flat and smooth surface. Then, when residual aberrations were suitably corrected, the only constrain between center and corner rays was vignetting caused by the so called cos4 Law . Nowadays, light must arrive at the sensitive material after crossing trough a lot of physical materials as, at least, IR filter, low pass filter, micro-lenses and Bayer filters. It is not so difficult to understand that the angulation of the light rays presents now a new approach. What was a constraint in the past, seems to be a certain advantage nowadays. 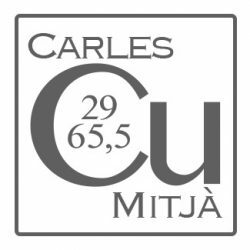 Although from this short and limited assay it cannot be derived that this is the reason why high end camera bodies remain still SLR, it is not too risky to say that could exist some relationship. There is may be an exception in the market with the Hasselblad X1D camera. Nevertheless, its price, its non interchangeable sensor and the dedicated X Lenses System, could probably hide some answers to these questions.